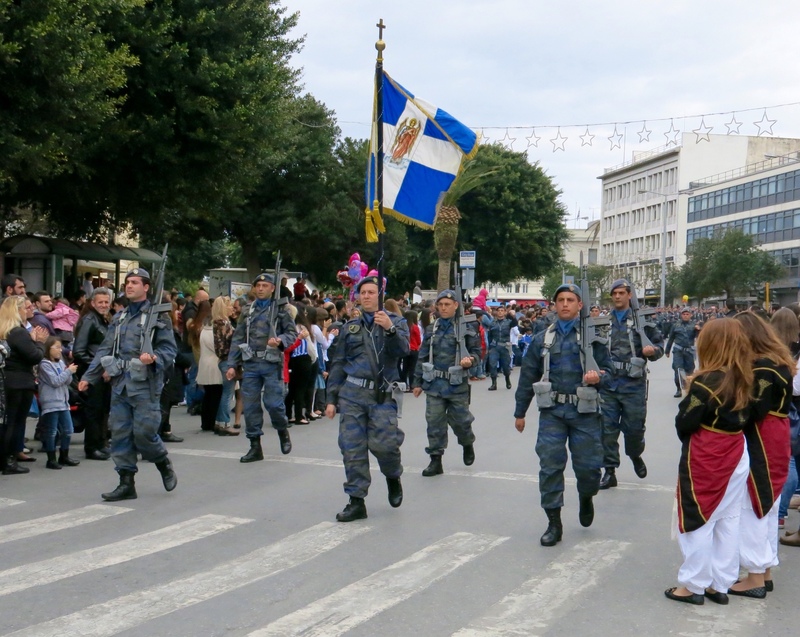 “Freedom or death” were the words uttered by the Bishop of Patras on March 25, 1821, as he raised the flag of revolution over the Monastery of Agia Lavra in the Peloponnese, and these words became the motto of the War of Greek Independance against the almost 400 year rule by the Ottoman Turks. Today it’s the 194th anniversary of that auspicious occasion, and I suppose that those words still have some meaning to modern day Greeks, what with the new battle they find themselves fighting, though this time against the so-called ‘Troika’ of the IMF, the ECB and other Banks….. good luck this time, methinks they are going to need plenty of it. 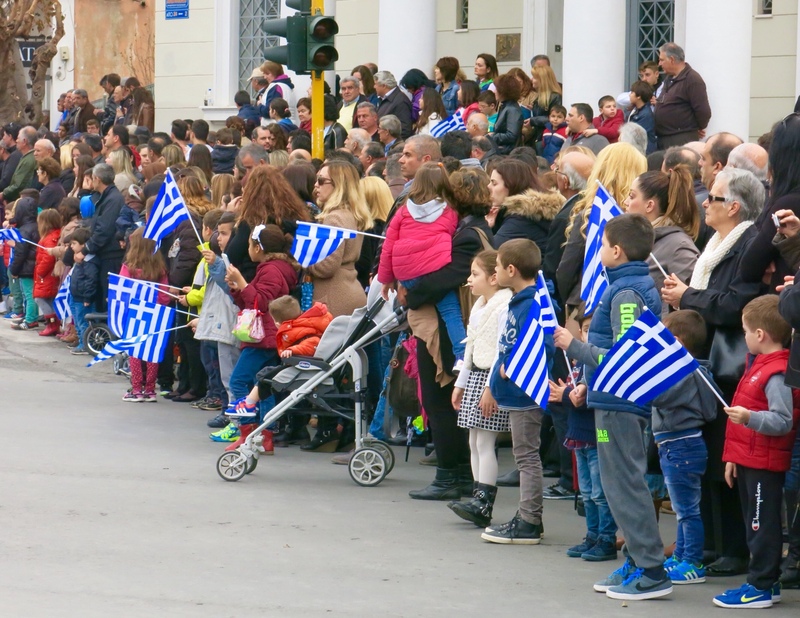 The Greek Crisis certainly gets lot of airtime on the TV news channels, and is a constant source of discussion on the street and in the kafe-neon’s here. 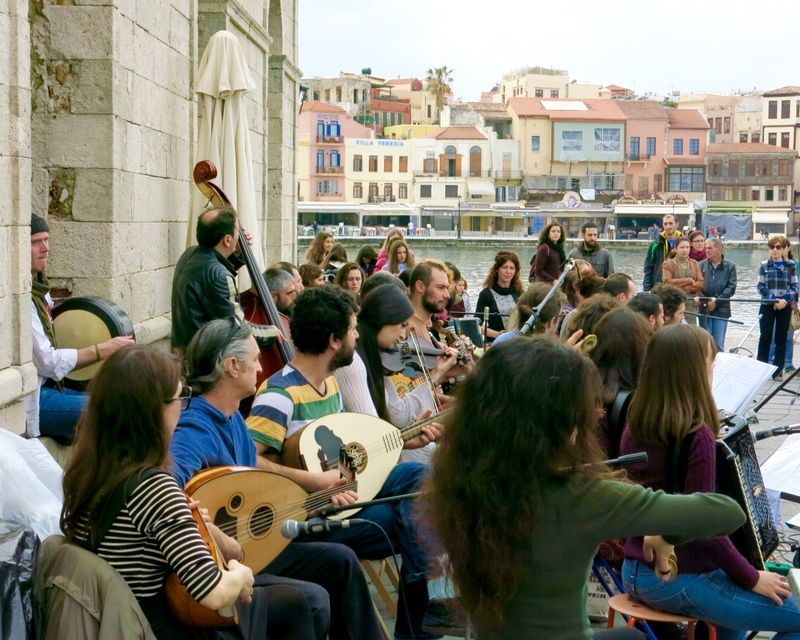 But here in Chania, at least on the surface, you’d never know there was much of a crisis. Certainly, there seem to be a few more empty shops, cafes and offices with old ‘for lease’ signs on them, than there were when we were here 3 years ago….. and maybe a few more people begging on the street, but most of the bars, cafes and tavernas here in Chania all seem to be doing a good trade. With youth unemployment around 50%, I’m amazed to see so many young people packing out these places….. where does the money come from? 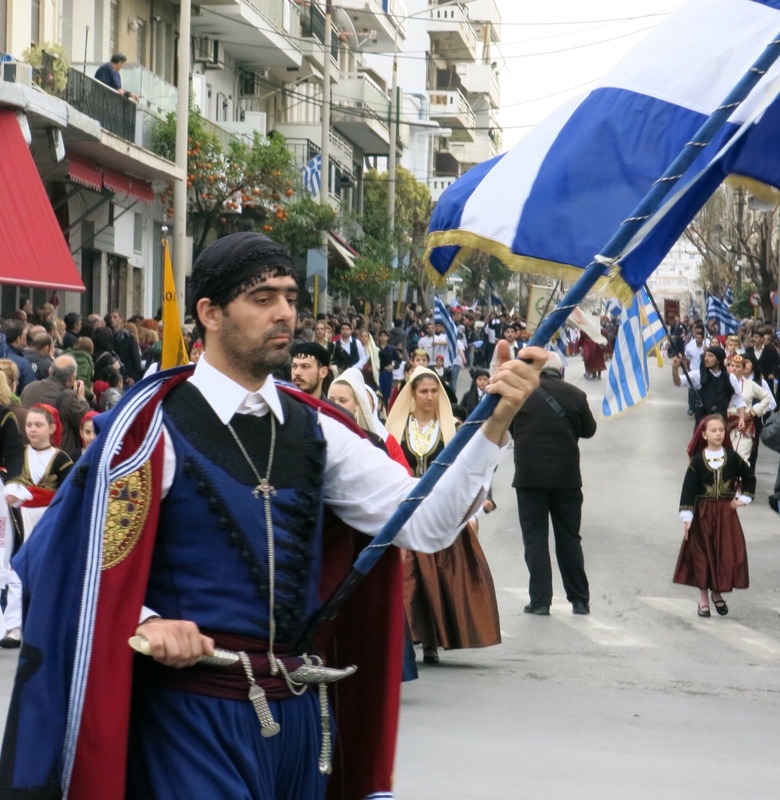 But enough about problems and politics, today is a day of celebration and commemoration, and it is not unlike our Anzac Day….. except that unlike us, the Greeks happened to win their battle against the Turks! It’s a pity that the weather has changed, as yesterday was such a glorious sunny day. 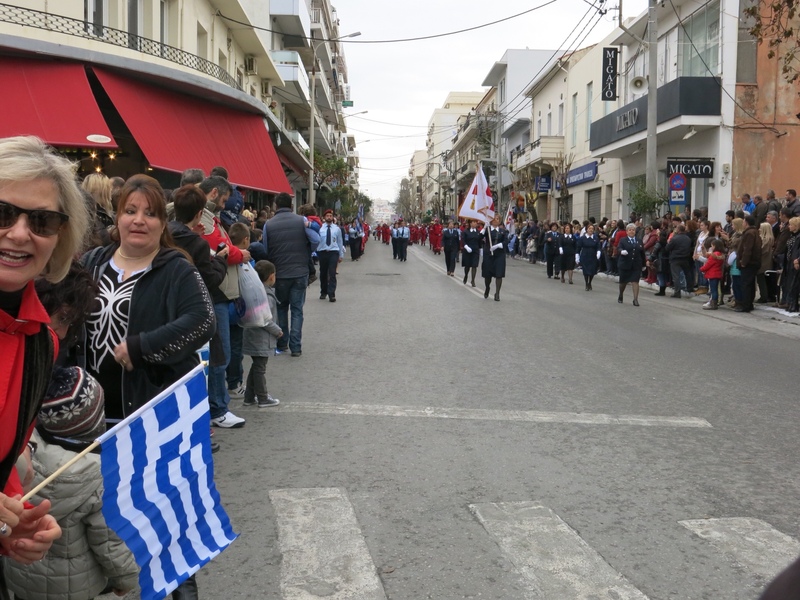 The church bells were particulary loud this morning and we awake to overcast sky’s and scattered showers….. but not enough to dampen our enthusiasm to go out and watch ‘i Parέlasi’… the parade. 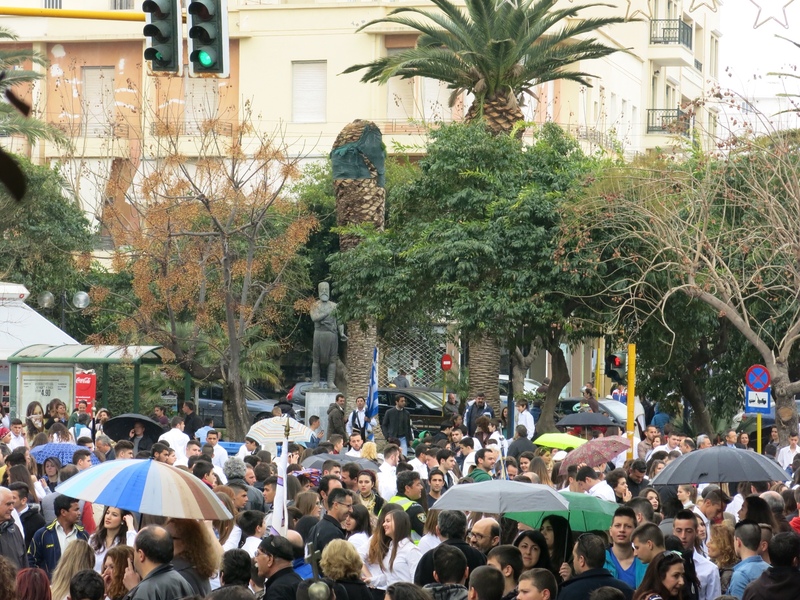 We’ve been told it starts at 12 noon from Platia Eleftherias, or as the locals call it, Dikastirio, but time is a flexible notion in Crete, and anyway, it’ll take the first lot of marchers at least 15 minutes to reach the town centre, so we dont leave the house till 11:45. 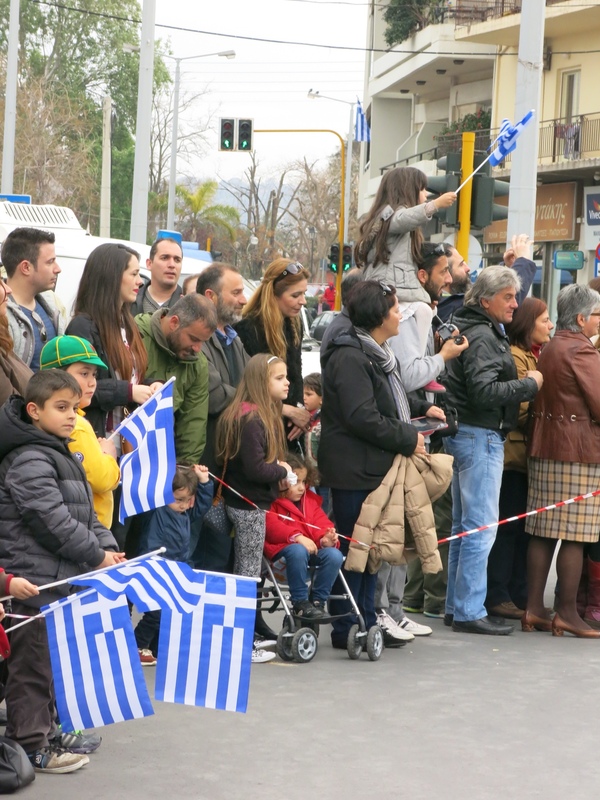 It’s only takes us a five minute stroll to reach the parade route, and jostle with the crowd to take up our position at the bottom of Andrea Papandreou Street. As it’s an Official Holiday today, the schools are closed as well as all the shops, offices banks etc…… some cafes, tavernas and restaurants are open, as are a few tourist shops around the harbour, but most everthing else is shut for day, Consequently the streets are very crowded, with lots of kids all waving the umistakeable blue and white striped flag of Greece… what a great atmosphere. The rain has held off so far, and we can here the sound of the drums of marching band getting closer…..and here come the first lot of marchers, a contingent of Nurses, then the Search and Rescue organisation, followed by boy scouts, cubs, girl guides, people from different villages in national costume, followed by more schoolkids etc etc…. haven’t seen anyone from the military yet though! hand on his knife…ready for action? After a while, we move to a different spot nearer to the market-place, with a better view and so that I can take some photographs of the crowd. By now, the first lot of marchers have reached the end of the parade and are walking around and mingling with the crowds…. 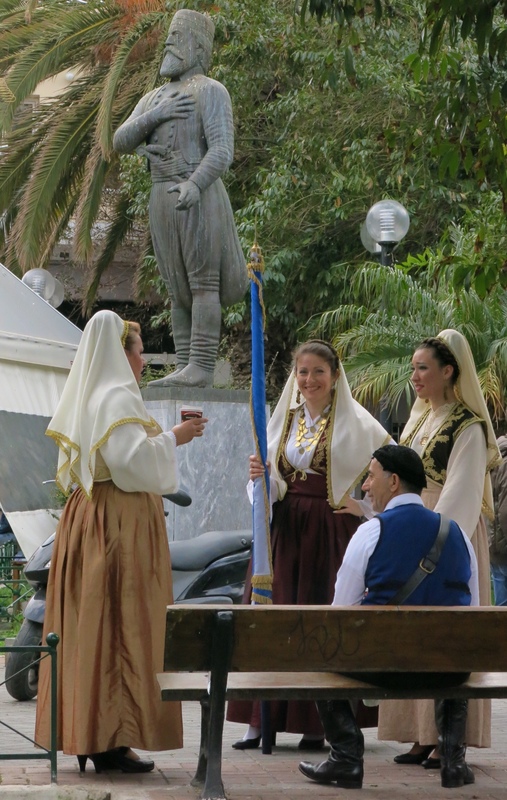 and very colourful they look too in their Cretan national costumes. Lots of photo opportunities today. 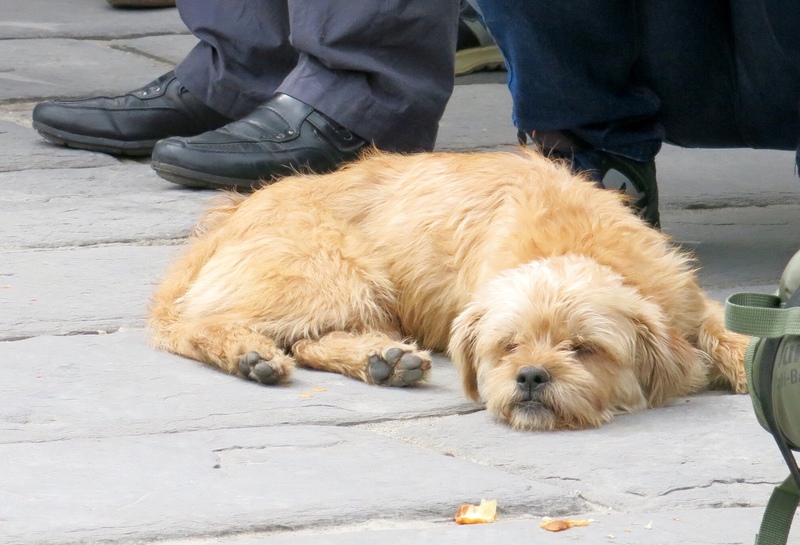 not everyone was enjoying the parade…. 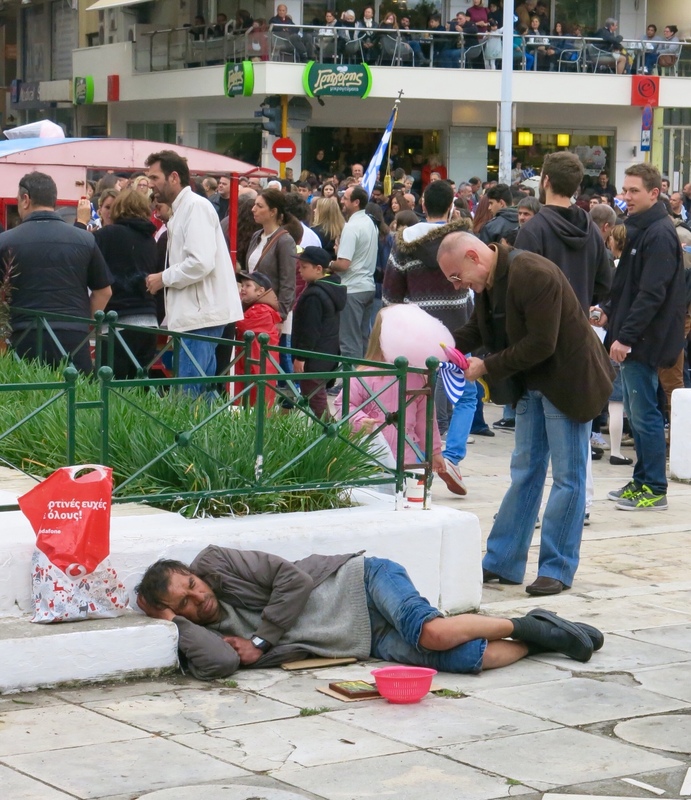 one of the unfortunate victims of the ‘crisis’? Back to the parade, and at last, here come the military….. a few jeeps and personell carriers to start, with a veteran or two onboard, along with some children…..and then suddenly we hear the sound of boots marching in extra-quick time….. I’m not sure if that’s the correct terminology, they are actually trotting along at quite a pace….. and shouting at the same time. Dont ask me what thay are shouting though…. but it’d scare the bejeezus out of you if you were the enemy….. they are all dressed in camouflage fatigues….and they look like some tough MoFo’s! 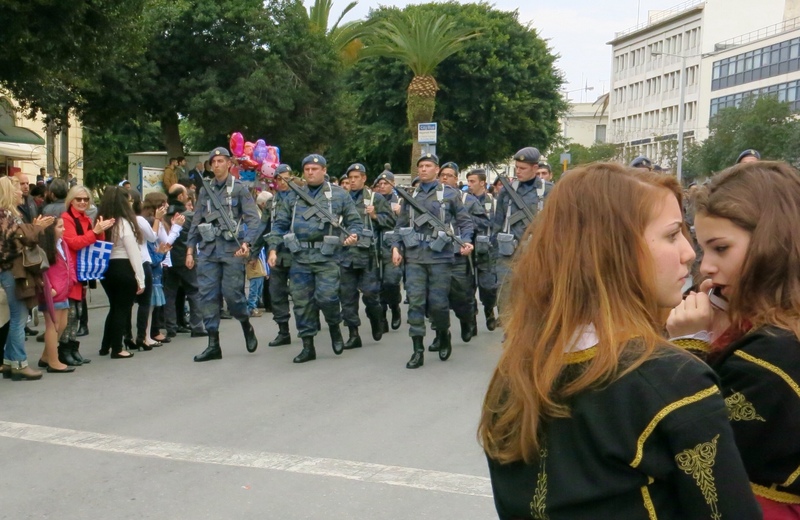 YM loves a man in uniform…. look how excited she is. all the bad girls, love a sailor, all the bad girls love a tar…. Next come the Airforce, then the Navy, and finally, making up the rear of the parade is The Salvation Army Band….. actually I made that bit up, it’s a band allright… a bit ragtaggle…. but maybe not the Salvo’s. It’s all over at 1:30pm and even though the streets are full of pedestrians, the police on duty remove the barriers, and the motorbikes and cars try to negotiate their way through the crowds on the main street through town. It’s a wonder that no-one is injured in the muddle, but as mentioned before, OH&S is not a strong point here. In Australia we seem to take it to ridiculous lengths, but here it’s the opposite…. and quite refreshing too. 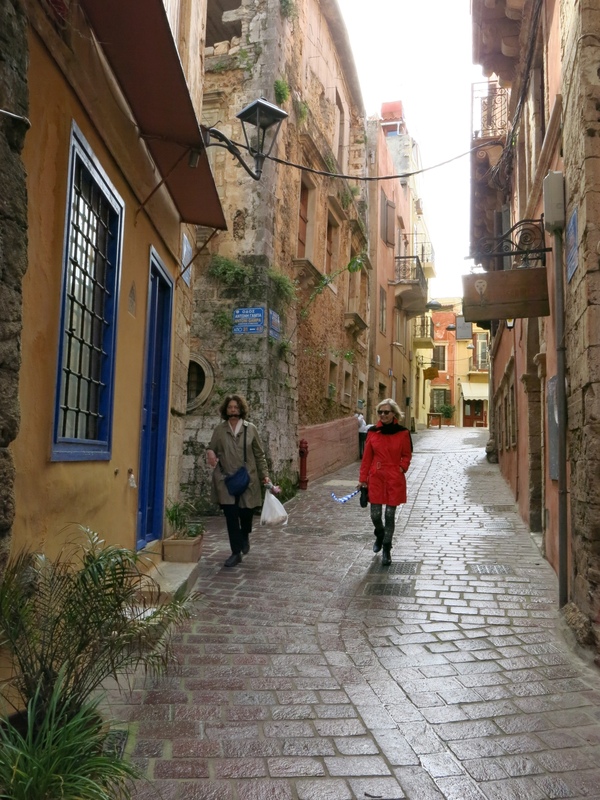 The rain has eased and the parade and crowds have all dispersed, so YM and I stroll back into to the Old Town and make our way down to the harbour. The cafes and restaurants we pass on the way are all chock-a-block full with families and friends enjoying their day off….. Crisis, what crisis? 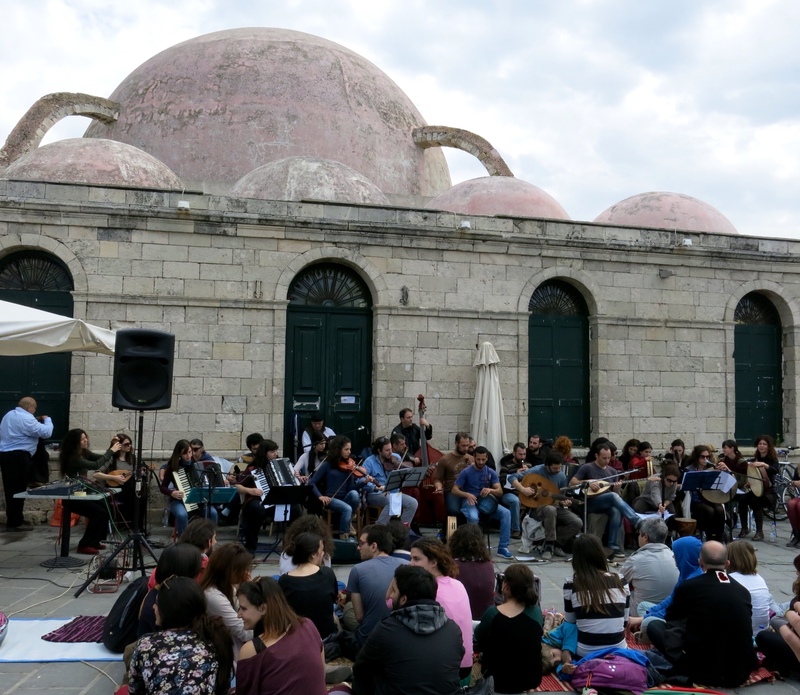 the orchestra at the old mosque..
On the waterfront, outside the old building that at one time was a mosque when the Turks ran the joint, a large crowd has gathered to listen to a small orchestra playing and singing their traditional greek songs, so we stay for a while ourselves, until the rain puts a dampener on it. As we make our way ‘back home’ along the waterfront, one of the cafe owners calls out to us to come in and have a drink ‘on the house’. His taverna is one of those right on the seafront, which cater mainly for foreign tourists…… their position and the view from them are great, and the ambience is OK…..I call it ‘Zorba-style’…. Bouzouki music playing, traditional chairs & tables, fishnets hanging from walls, and octopus hanging to dry outside …. and of course, a menu that has a photo of each item on it……Mmmmm…..all of which is in direct contrast to their food…… factory made Mousaka, frozen vegetables, frozen fish, supermarket french fries ……and at this time of year, with tourists as scarce as a pork sausage in Israel, most of these places are struggling to get customers. I feel quite sorry for them, but I know that in the summertime they do a roaring trade. 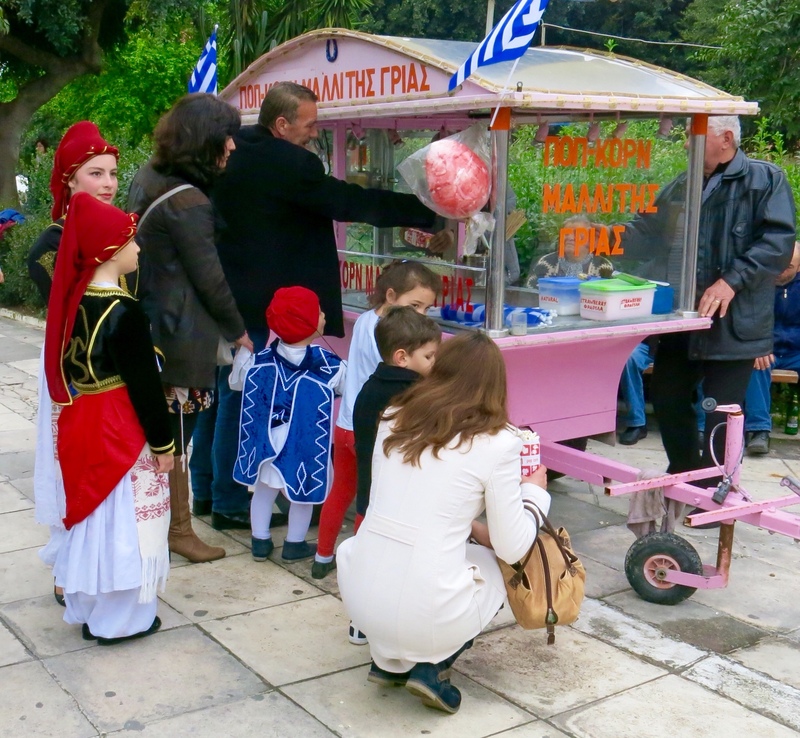 Most of these tavernas, in their prime waterfront location, employ a ‘kamaki’ ( it’s greek for ‘harpoon’) who stand outside and ‘encourage’ ( persuade/entice/harass ?) and ‘hook’ any likely looking tourists who happen to be passing by to come in and sit down for a meal. 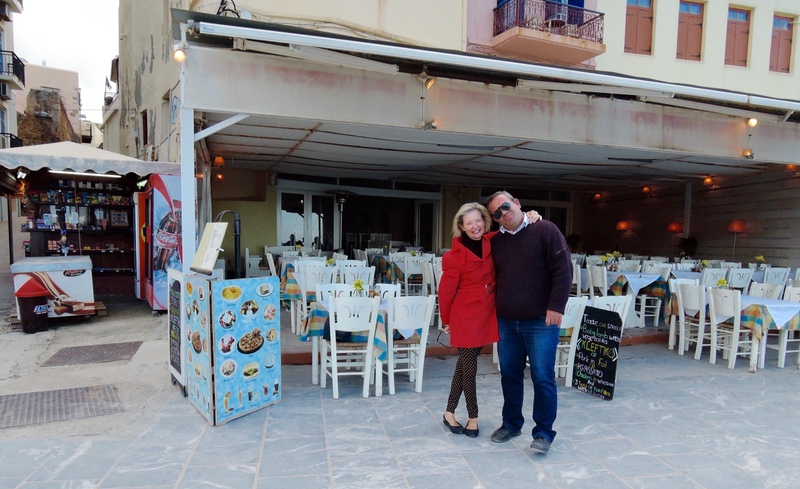 This particular Zorba-style taverna has a very friendly ‘kamaki’, named Nektarios, and at least a couple of times a day, either on our way out, or on our way back home, whenever we pass by, he stops us for a quick chat….. he really is a lovely guy with a wicked sense of humour. Anyway, It’s payback time, as yesterday, after I had finished my greek language classes, we were headed home for lunch, and stopped off there for a quick drink…. as I said, it’s very close to ‘home’…. and YM felt guilty that we’d never had a meal there, or even a drink, so why not stop for once. As usual, there are no other customers…. it’s about 2 in afternoon…. I ordered a ‘Fix’ for me ( the best beer in the world?) and a ‘tetarto’ of ‘lefko’…. a quarter kilo of white house-wine for YM. 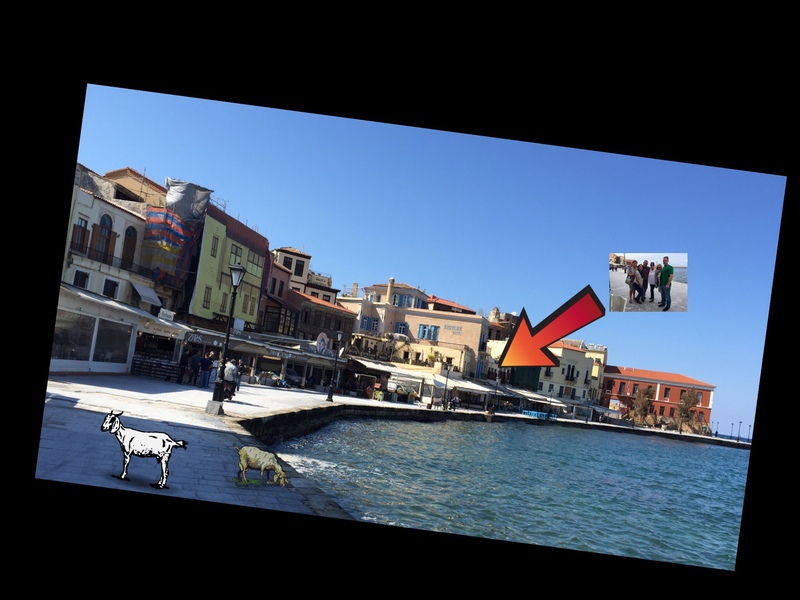 Well that’s what I ordered, but this is Crete, and while I got my beer, YM didn’t get a quarter kilo of wine, but rather a half a kilo…. ” tetarto on me” say’s Nektarios when I point this out, and he then resumed his duty out the front. Success too, as quite soon, seeing us enjoying a drink, he snags a young couple passing by, who sit near us. 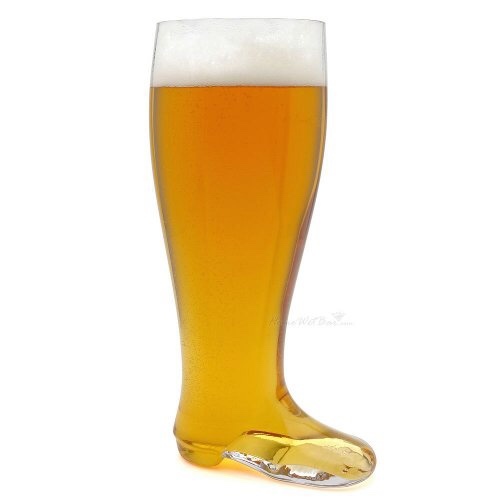 I notice that the waiter has brought them a huge ‘boot’ of beer each…. about two litres in every ‘boot’! A few minutes later another couple get snagged and take a seat, also nearby, also being served with this ‘beer boot’… First couple turn out to be American, who ask me if I could take a photo of them, which I obligingly do….. the young girl is very attractive and so while YM slips into her ‘Parkinson’ mode ( a friend says she suffers from’Parkinsons Disease’…. she can’t stop asking questions!) and begins her interview with them, I take photographs of the Angel. ( steady on, that’s her name, Angel). Within a few minutes, others passing by, seeing us enjoying ourselves, also sit down…. (maybe they have heard that Michael Parkinson is in town) …. and all without Kamaki assistance! Well, about an hour later, and a few drinks later (a half kilo of wine doesn’t last long here, it has something to do with Global Warming…. it’s the evaporation factor!) and by now the Taverna is full of Americans, all drinking ‘boots’ of beer…… talking LOUDLY and enjoying themselves immensely. 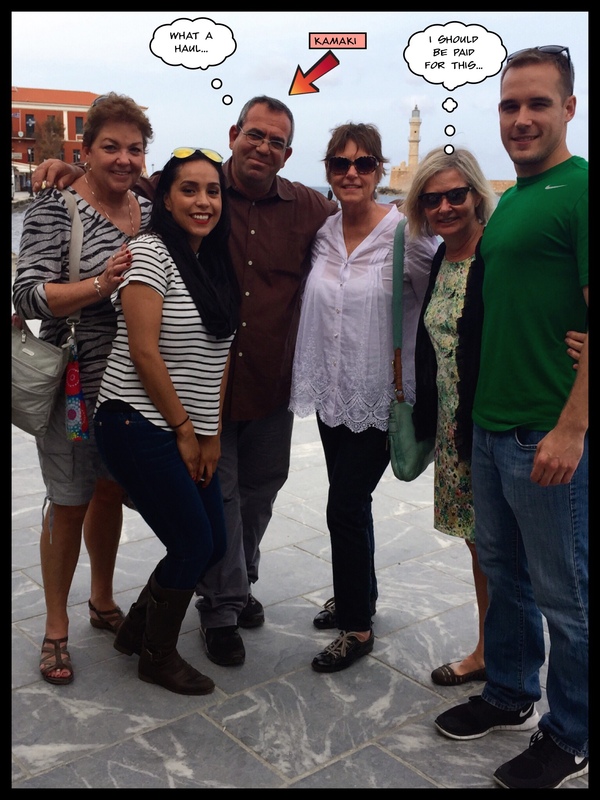 It turns out they were part of a coach tour of the Greek Islands….were in Xania just for the afternoon…. and were passing the time while waiting to catch their coach back to Heraklion. For the ones that YM got to interview, she passed on to me the information that it was their first visit to Greece…..I do hope that it’s not their last. 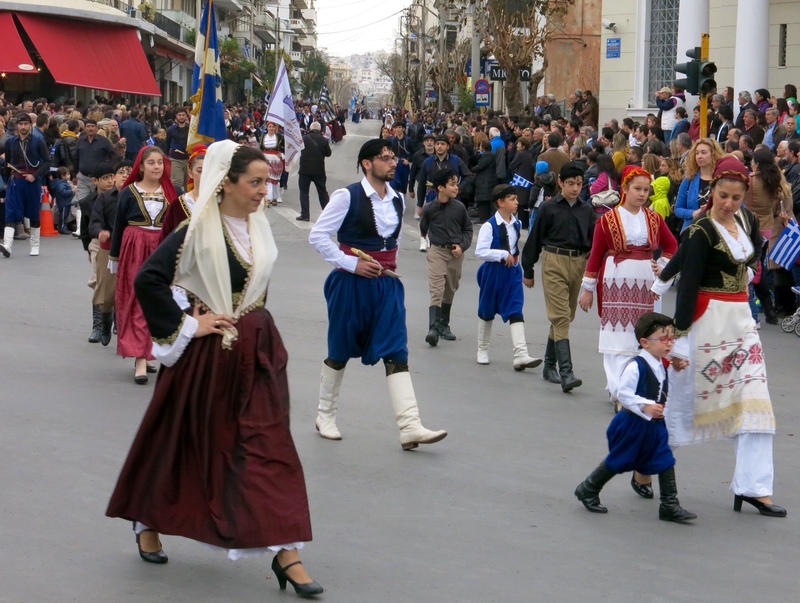 When we leave them to go home for our lunch……fasolakia, is in the oven cooking….. they all seem to be enjoying themselves immensely, some even attempting ‘Zorbas dance’ along the waterfront…. hopefully they got back to their coach OK ……. and I wonder to myself if they have a toilet onboard, as they’ll certainly not be able to hold those beer ‘boots’ all the way back to Heraklion, that’s for sure !!!!! So, back to this afternoon again, on Independance Day, and our Kamaki friend stops us for drinks, as I said, ‘on the house’. It’s to thank us for helping bring in all the customers he had yesterday….. one of his busiest afternoon’s so far this year. 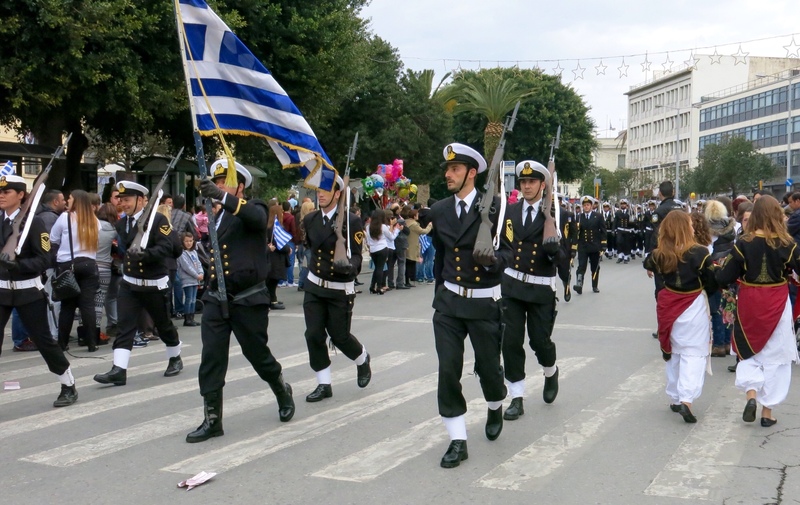 The owner then comes to join us, and also thank us….. my greek language skills are still not as good as I’d like, despite all the lessons I take here….. but I’m certain he offered YM a job as assistant ‘kamaki’…..
in Sydney – talk about men in uniform! lots and lots of them…haha. Assistant kamaki – new job opportunity for YM………. love it. Her questioning is legendary and now in Xania too. Well written!! Tel YM to call me if she would like to resume the local questioning!